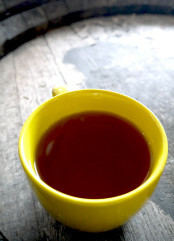 Lapsang Souchong is a Black Tea, famous for it's smoky aroma and flavour. From China this tea has been dried over pine and cedar wood fires and gains a smokey flavour. It is a popular tea today, but is definitely an acquired taste. Unfortunately due to supply and regulation issues that we had experienced bringing this smoked tea in from China and in order to become compliant in line with EU regulations, and source a Lapsang, the taste profile of this tea is now slightly less smokey than we would have been used to. The traditional method of smoking this tea over a Pinewood fire has had to be reduced in time to make it compliant resulting in a more delicate smoked flavour, but still giving off that traditional smoked tea that we all enjoy! Do you like smoky whisky, marmite or Guinness flavours? You'll not be disappointed with this Lapsang Souchong Loose tea; it is smoked with cedar wood and pines. Why so smoky? In the early 17th century when export to Europe started, the traditional green teas did not travel well and quickly lost quality during the 15-18 month journey across land and sea. The producers developed different drying methods in order to keep the tea for longer, this consisted of racks built over ovens that allowed the heat to rise up through vents in the ceiling and into the drying room above. To fire the ovens, they used local pine wood from the forests near the factories and as the wood slowly burned, it gave off a certain amount of smoke that was absorbed by the drying tea leaves. This process is still used and gives the tea the distinct smokey flavour we know (and love) today. Unfortunately due to supply and regulation issues that we had experienced bringing this smoked tea in from China and in order to become compliant in line with EU regulations, and source a Lapsang, the taste profile of this tea is now slightly less smokey than we would have been used to. The traditional method of smoking this tea over a Pinewood fire has had to be reduced in time to make it compliant resulting in a lesser flavour, but still giving off that traditional smoked tea that we all enjoy! 100% premium smoked Chinese black tea. Use freshly drawn boiled water. Infuse one tea measure per pot and brew for 2-5 minutes… enjoy! Product : My husbands favourite tea. Smells like a bonfire! Service rating : Fast Efficient Service. Tea arrived well packed and safely. The Turkish Delight tea is just exquisite! Service rating : first class service is the most important aspect. The only negative is the free dispatch is getting slower! Product : This was a new one for me, a trial you might say! I would not want to drink it all the time but like the smoky overtones. Easy to use website, super fast shipping to the USA at a very reasonable price. the only negative is that your £/$ is a bit old! Fantastic product! Quick delivery! Thank you.